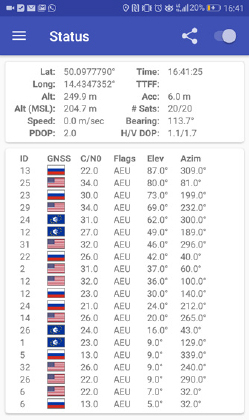 Android users can download the GPSTest application that will check to see if your phone is currently using Galileo satellites to determine its position. Use the GPSTest app (or similar) to find out whether your smartphone is benefiting from the increased positioning accuracy that Galileo provides. As Galileo is a native feature of the smartphone hardware itself, the only way to have Galileo capability on your phone is to purchase one that comes with a chip that tracks Galileo. The good news is that most of the chips found in phones are multi-Global Navigation Satellite System (GNSS), meaning they use data from more than one GNSS constellation. The question is, which constellations is your phone using? Android users can choose from several applications, most of them available free of charge, that will check if your phone is currently using Galileo, GPS or Glonass satellites to determine its position. For example, to test whether your phone uses Galileo, you can download the GPSTest application from the Google Play store or F-Droid. This open source app, developed by Dr. Sean Barbeau, who is the Principal Mobile Software Architect for R&D at the Centre for Urban Transportation Research at the University of South Florida, displays real-time information for satellites in view of your device. Once you have it installed, simply launch the app. “In just a matter of seconds, you should be able to see the available satellites providing positioning data to your device,” says Dr. Barbeau. The application shows four global constellations: GPS (American flag), Galileo (EU flag), GLONASS (Russian flag) and Beidou (Chinese flag). It also shows regional satellite-based augmentation systems (SBAS), including QZSS (Japanese flag), GAGAN (Indian flag), ANIK F1 flag (Canadian flag), Galaxy 15 (American flag), Inmarsat 3-F2 and 4-F3 (UK flag), SES-5 (Luxembourg flag), and Astra 5B (Luxembourg flag). “You will likely see that your phone is using several GNSS for positioning, and if one of those is Galileo, you should be able to see the blue Galileo flag on the app,” notes Dr. Barbeau. However, Dr. Barbeau notes that those currently using their smartphones in the US will not see the Galileo flag, even if their phone hardware supports Galileo signals. This is because the US Federal Communication Commission (FCC) must first approve Galileo before any devices can use its signals on US soil. The European Commission’s application is under review by the FCC, and this regional limitation will hopefully be removed soon. To learn more about all of GPSTest’s many features, please read this. In addition to GPSTest, users can choose from many similar applications. To see how Galileo is improving the accuracy of GPS, users can download GNSS Compare. The winner of the Galileo App Competition, which was jointly organised by ESA and the GSA, this app not only shows the device’s “use” status, but also compares the positioning accuracy in real time. When your phone is calculating its position using GNSS, having access to more satellite signals means better location accuracy and a faster fix. Therefore, the advantage of having a Galileo-enabled phone is that the location can be calculated using the 17 currently available Galileo satellites, on top of GPS and other GNSS constellations. This is particularly helpful in urban environments where narrow streets and tall buildings block satellite signals and limit the usefulness of many mobile services. Broadcom, Qualcomm, Intel and Mediatek all have included Galileo into their chips, many of which are used by leading smartphone manufacturers. For an up-to-date list of Galileo-enabled devices, please visit www.useGalileo.eu.